Effective leaders know there is always more to learn and room to grow. A toxic leader, however, may not believe they have anything else to learn or improve. These leaders blissfully go about their daily business, often unwittingly poisoning everything they touch – affecting performance, trust, and morale. This poison slowly seeps into the very fabric of your organisation. 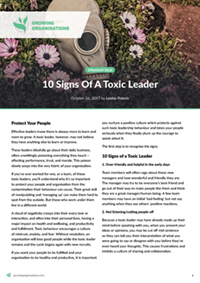 If you’ve ever worked for one, or a team, of these toxic leaders, you’ll understand why it’s so important to protect your people and organisation from the contamination their behaviour can cause. Their great skill of manipulating and ‘managing up’ can make them hard to spot from the outside. But those who work under them live in a different world. A cloud of negativity creeps into their every task or interaction, and often into their personal lives, having a major impact on health and wellbeing, and productivity and fulfillment. Toxic behaviour encourages a culture of mistrust, anxiety, and fear. Without resolution, an organisation will lose good people while the toxic leader remains and the cycle begins again with new recruits. If you want your people to be fulfilled and your organisation to be healthy and productive, it is important you nurture a positive culture which protects against such toxic leadership behaviour and takes your people seriously when they finally pluck up the courage to speak about it. The first step is to recognise the signs. Team members will often rage about these new managers and how wonderful and friendly they are. The manager may try to be everyone’s best friend and go out of their way to make people like them and think they are a great manager/human being. A few team members may have an initial ‘bad feeling’ but not say anything when they see others’ positive reactions. Because a toxic leader may have already made up their mind before speaking with you, when you present your ideas or opinions, you may be cut off mid sentence so they can tell you their interpretation of what you were going to say or disagree with you before they’ve even heard your thoughts. This causes frustrations and inhibits a culture of sharing and collaboration. A toxic leader may be a know-it-all and not value input from others. They will find it difficult to listen to or appreciate an idea that differs from their own opinion. They may even come back later and present someone else’s idea re-packaged as their own and not even remember they had previously dismissed it. Eventually their team will give up offering their input or challenging them on anything. They usually have a reason or an excuse for their behaviour or blame others for problems. With high confidence in their abilities, they may believe they don’t need to develop. They prefer to surround themselves with ‘yes’ people who won’t challenge them. As well as an inflated sense of their own abilities and importance, they are often self-serving, and driven by their ego. They constantly remind us of how skilled or experienced they are and take credit for others’ hard work. 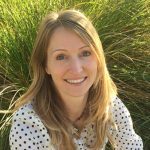 I had one leader who used to frequently tell our team she was ‘older and wiser’ than us and, in every meeting, would find a way to mention how she was more experienced and knowledgeable than others (who happened to be specialists in their field!). These ‘ankle-biter’ leaders are always interfering where and when they shouldn’t and taking over tasks they’ve already assigned to others. They may treat their staff like children. They create a double-up on work and leave their team members exasperated and feeling untrusted. Champions of not practising what they preach, a toxic leader will be the first to reprimand a staff member for something they themselves do frequently, creating a huge sense of injustice in the team. They may fail to follow systems and processes they or others in the organisation have worked hard to implement. Because they often rule with emotion, they can make rash decisions, give mixed messages, change the rules as they go, and often forget what they have said to different people. Their actions are often not in line with their words and they may even tell outright lies if it serves them in the moment. They are prone to displaying favouritism. They may intimidate members of their team and use the phrase ‘because I’m the boss’ as an explanation for a decision. They use their position to gain compliance rather than being open and honest to gain commitment. They don’t value transparency. Having exclusive information can make them feel powerful and in control. They are often seen sucking up to higher power at any cost rather than serving and supporting their team. Toxic leaders may lack empathy and self-awareness in interactions, failing to see how their actions and decisions affect others, and not picking up on signs of rising relationship tension. Because they can’t put themselves in the shoes of others, it makes it very difficult for them to truly consider others in their behaviour and decision-making. They often assume they know what others are thinking and feeling based on their own world view. Each of these 10 traits is rarely seen on its own, so if you notice (or are made aware of) more than three or four of these in any of your leaders, alarm bells should be ringing and it’s time to take action! For more information on how you can increase the performance and fulfillment of your people and accelerate trust, flow, and growth, contact the Growing Organisations office.